Aerogelex, born out of TUHH and the Nanohybrids project, has qualified for Stage 1 of the Nanomedicine Translation Advisory Board (nanomedTAB). The Nanomedicine Translation Advisory Board provides unique, free of charge access to high-level experts, who will advise and guide to accelerate our project to the market. The Translation Advisory Board (TAB) aims to help to make the right strategic choices at the right time, reducing risks and maximizing the chances of success. Stage 1 will be held in Malaga at the annual ETPN event between the 17-19 October, 2017. The next objective is to further gain access to the EU Nanomedicine Characterization Lab (EU-NCL) at the ETPN 2017. This platform provides access to free clinical testing and characterization. Applications of aerogels in nanomedicine have not been in the direct focus of NanoHybrids. 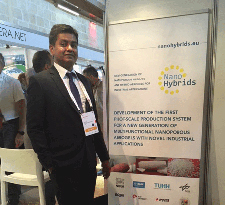 However, the pitching of Aerogelex at the EuroNanoForum atttracted the attention of the Nanomed TAB team and they invited Raman Subrahmanyam to apply for stage 1 of their expert advice services. This shows how engagement between different European projects is able to create additional application and exploitation potential. The Nanomedicine Translation Advisory Board is a service that has been designed as the prime initiative to support the European Nanomedicine Community in mastering the huge step of translation and clinical testing. It has received funding from the European Commission and has been supported by the European project ENATRANS – Enabling NAnomedicine TRANSlation and the European Technology Platform Nanomedicine (ETPN). ENATRANS’ main objective is to network and support SMEs in translation of nanomedicine in Europe by providing services to interact and share information experience and advice. ETP Nanomedicine, an initiative led by industry and set up together with the European Commission is addressing the application of nanotechnology to achieve breakthroughs in healthcare.